As his name suggests Thomas Michael O'Farrell came from good Irish stock but was born in London on 31st March 1933. Tom's career was in land and property development. However, he did have some connection with entertainment as the managing director of various leisure industry concerns. Among his various business appointments he was Fellow and Founder Member of the Incorporated Guild of Surveyors; Fellow of the Architects and Surveyors Institute; Fellow of the Institute of Charted Surveyors; Lay Member Independent Tribunals Social Services Appeals Tribunal and Vice Chairman Independent Monitoring Board, HM Wormwood Scrubs Prison (Home Office appointment), in addition to being Trustee of a charity managing homes for mental health in Camden & Brent. He was also a fundraiser for MENCAP Windsor. Tom was a Commander of the Order of St John of Jerusalem, Freeman of the City of London, member of the Guild of Freeman and Liveryman of the Guild of Plumbers. Tom was also a dedicated member of the Freeman's movement having been a member of many Lodges and also Master of at least seven Lodges. 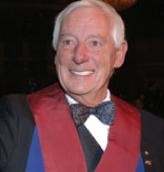 He joined the Chelsea Lodge in 1992 and became their Master in 2006. Although not an entertainer it was because of his charitable work that he was invited to join the select band of Companions of the Grand Order of Water Rats. These gentlemen are headed by our Senior Companion HRH Prince Philip, Duke of Edinburgh and are limited to 24 members.